Colorectal cancer is the second most common cause of cancer in the United States. The overall mortality rate for this disease approaches 60 percent. 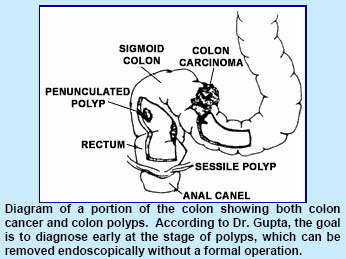 "There are a large number of approaches mentioned for detecting colon cancer early, usually at the stage of a polyp. By diagnosing colon cancer with a screening program, the mortality is anticipated to be much less," Dr. Gupta says. The challenge for physicians is in determining which individuals should be screened, how often, and with which diagnostic tests, Dr. Gupta says. Dr. Gupta suggests an approach that he feels reflects the consensus in the current medical literature. "With this approach, we divide people into three risks categories: average, high risk and moderately high risk," Dr. Gupta says. recommended once a year for two years, and every three to five years thereafter," Dr. Gupta says. According to Dr. Gupta, this group includes individuals who have already had colon cancer, a neoplastic polyp. Also included in this group are those who have ulcerative colitis or familial polyposis disease. These individuals may be under 45 years of age. For these individuals, a colonoscopy is recommended once a year for 2 years, and then every three to five years thereafter. 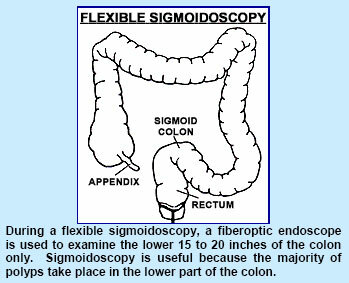 A colonoscopy is an examination of the entire colon with a flexible scope.